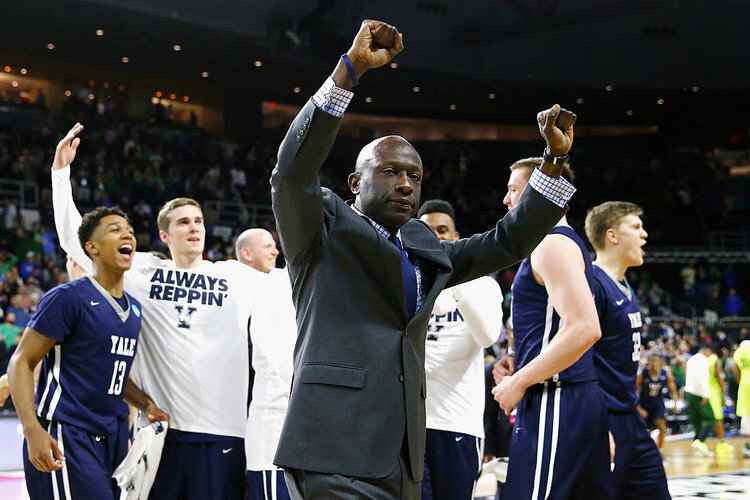 Yale head coach James Jones took the spotlight Friday night in New Haven as he gained his 300th career win, only the third coach in the Ivy League to attain that total. 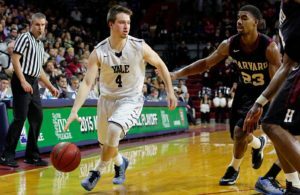 It came as his Bulldogs (12-3, 2-0 Ivy) defeated Brown (12-6, 0-2 Ivy) for the second time in six days, but was not quite as close as when Yale won in Providence, 70-67. 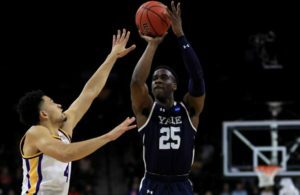 This time, although the Bears crept to within two possessions in the second half, Yale went on a 13-2 run and its largest lead, 63-46, with 6:39 left. Alex Copeland (19), Miye Oni (15 with 12 rebounds) and Blake Reynolds (15 and nine off the boards) topped Yale, but Brown’s Tamenang Chob led everyone with 24 points and 15 rebounds. Yale, which has now won eight straight, could be joined by one or two other teams, pending the outcome of Dartmouth-Harvard and Cornell-Columbia on Saturday. Harvard (1-1) got even with Dartmouth (1-1) Saturday after losing decisively two weeks ago on the Big Green’s floor, but it wasn’t that easy on Saturday (Jan. 26), although this time the venue its own Lavietes Pavilion in Cambridge. Dartmouth led 26-25 at the break. Bryce Aiken, a Harvard junior from Randolph, N.J., made a 3-pointer to even the score 46-46 midway in the second half. Dartmouth hung around and trailed by only 60-59 with 22 seconds left. Aiken then sank four foul shots on a pair of 1-and-1’s to close out the Harvard win. He finished with 14 points. Christian Juzang (19), and Chris Lewis (16) were the big guns for Harvard. Taurus Samuels of Vista, Calif., led Dartmouth with 13 points. After Harvard evened its Dartmouth series on Saturday afternoon, it was Columbia (1-1) doing the same with Cornell (1-1) in the evening on a 73-70 victory. As a result, only Princeton and Yale are perfect in the Ivy League, each with a 2-0 record. The other six teams are in a technical third place tie, both splitting its two games. This one at Levien Gym in New York went down to the wire. Gabe Stefanini, an Italian national from Bologna, Italy, hit two foul shots with five seconds on the clock to break a 70-all tie, but it required a missed 3-point attempt by the Big Red’s Riley Voss as time ran out to assure the Lions of the win. Columbia (6-10, 1-1 Ivy) led 60-49 with just under nine minutes showing. Then Cornell spurted to within two, 67-65 and shortly after the Lions’ lead was only 69-68. After trading baskets, Stefanini sealed it from the line. Each team had a pair who topped 20 points. Stefanini (24) and Quinton Adlesh (21) for Columbia and Jimmy Boeheim (22) and Matt Morgan (21) led Cornell. It was not an Ivy League game, but arguably the most significant one for the conference so far before over 8,000 fans at the Palestra on Saturday night. 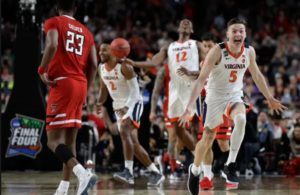 The University of Pennsylvania (12-4), despite already losing its only Ivy games, both to Princeton, served notice on the rest of the league that it will be a force to be reckoned with the rest of the way. All the Quakers have done was to win the coveted Philadelphia Big 5 championship with a 78-70 victory over Saint Joseph’s. The Quakers finished 4-0, having already defeated Villanova, La Salle and Drexel. This was their first Big 5 title since 1993-94. Freshman Bryce Washington had 23 points and 10 rebounds and AJ Brodeur added 20 points for Penn which was playing as the visiting team in its own building and wearing throwback red uniforms. No matter!